I’ll take over from here! 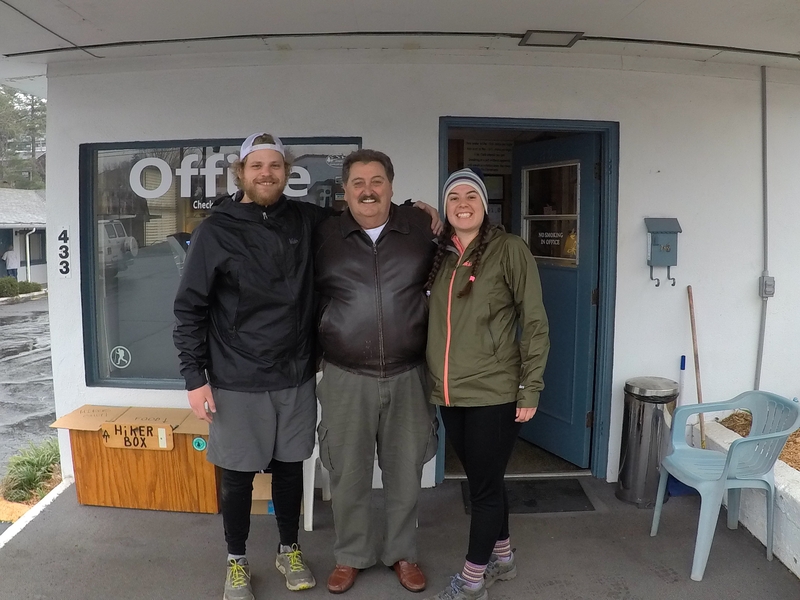 If you did not read, Clearwater brought us through our second week on the trail up to Franklin. Sorry again we haven’t blogged as often as we have we would like. Stay with us if at times we can only write multiple blogs while staying in town, like right now. I digress, let’s look back on our third week in the woods! We left off right as we met Ron. At the time we thought he was just a nice guy that stopped by to pick up hikers at Winding Stair Gap. He ended up being the owner of the motels we stayed at in both Hiawasee and Franklin without us even knowing it. This man is one of those people we know we will never forget. I could write an entire blog post on just how friendly, hospitable, and willing to help others he is. The Budget Inn we stayed at in Franklin was at a perfect location for us to wander and explore the town. Unfortunately, the zero day we took there ended up being on a Sunday and everything is either closed, or closed by 3pm on Sunday’s. We were pretty bummed because although small, the town had a lot to offer! Museums, unique shops, and historical sites were all within a short walk. We were able to resupply entirely at a dollar general! Pro tip: do your shopping at dollar stores! All of the food that’s pack-outable is sold in increments of three and four, the perfect amount without having extra to eat or get rid of. 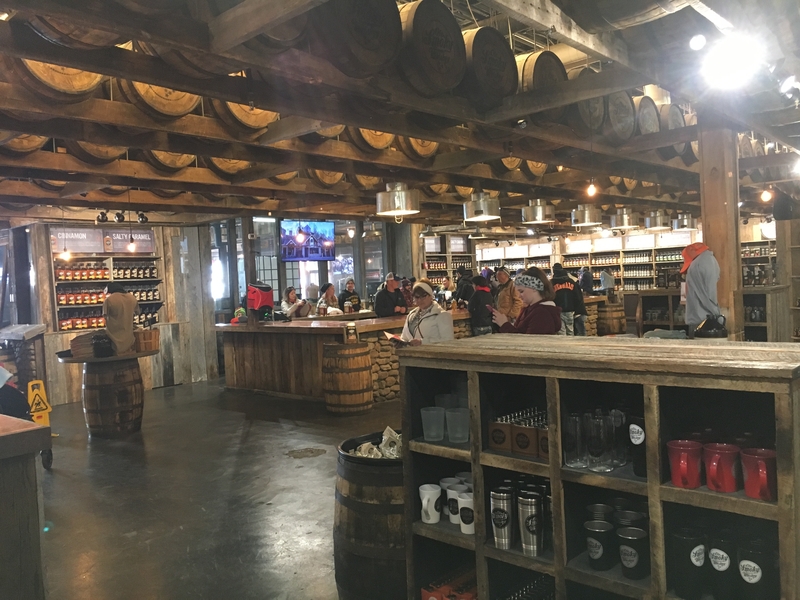 We were sure to be up a little early the next morning to check out Outdoor 76, a badass gear shop with a bar in the back. We browsed for a bit, grabbed a coffee, and walked back just as it was starting to sprinkle. Ron shuttles at 9 am and 11 am so we caught the 11 am and were hiking shortly after. The hike out of Franklin was really pretty and green. 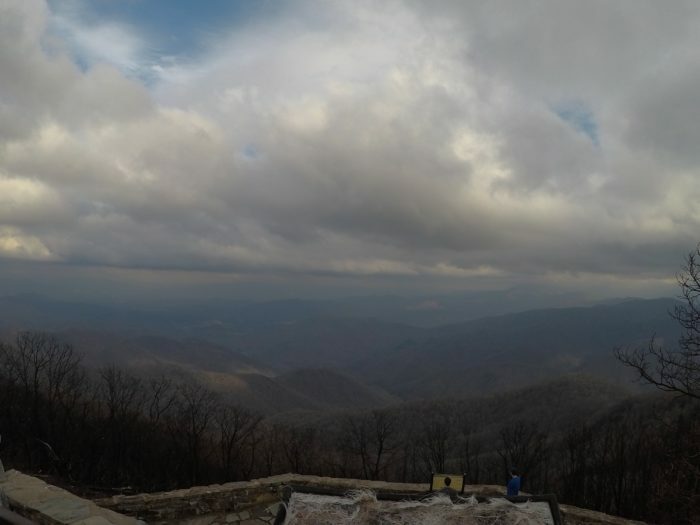 We steeply hiked straight up a mountain to one of the best views we’ve had so far at Wayah Bald. It was late evening by the time we got up there and made camp shortly after summiting. 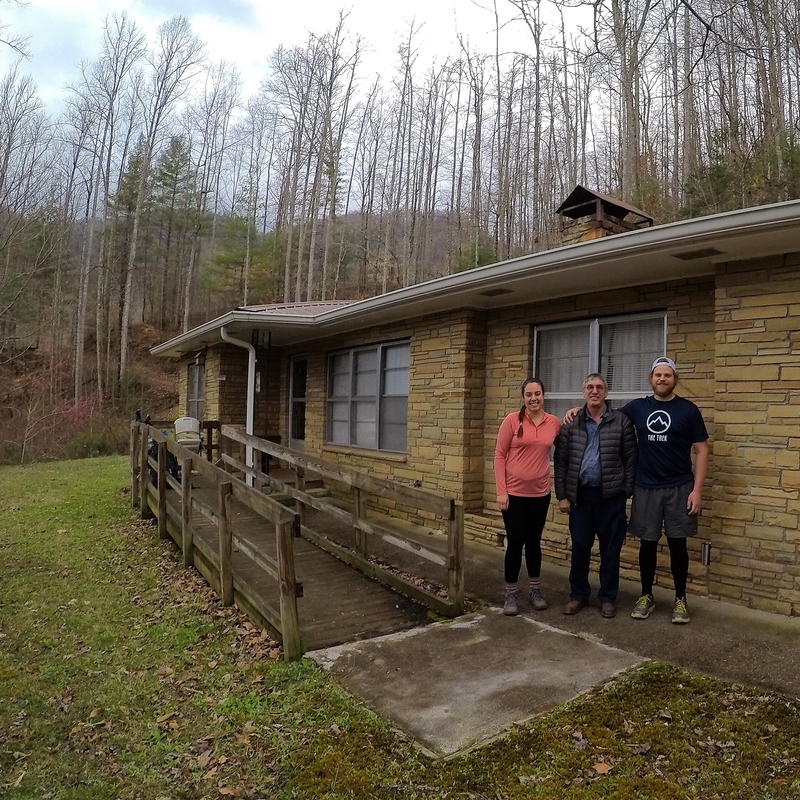 The following day we pushed seventeen miles in the cold and steady rain to a shelter about a mile from the Nantahala Outdoor Center, or NOC for short. This place was awesome. It was an outdoor hub of adventure right off the highway. We desperately needed to air our gear out after a tough day the day before so we checked out the gear shop and ate lunch there. Get the Sherpa Rice! It came recommended to me and I’m so thankful for the healthy energy it gave me to hike out of the NOC. After lunch we found a spot along the river and aired our gear out. We didn’t have much time because it was getting late and the next campsite was still about six or seven miles away. We either underestimated that hike leaving the NOC or we got too relaxed putting our feet in the river while our gear dried out. That hike was intense. We didn’t even make it to the next shelter so we found a flatish spot on the side of the mountain and called it a night. The next day our hike brought us down to Stecoah Gap. We weren’t planning on staying in Robbinsville but as we were coming down the mountain to the gap there was a stack of business cards with a hostels contact information that was not in our guidebook. On a whim we decided to check it out because we hiked about fifteen miles that day and town food sounded too good to pass up. Lonnie picked us up and we learned that he was in the same category as Ron under people we won’t forget. Lonnie had spent his whole life in Robbinsville and even the hostel is the house he grew up in. We stayed with a new friend at the hostel and had Bojangles for dinner. I ate a twelve piece supreme and they gave me six honey mustards. The fat boy Inn me rejoiced. We had breakfast together and took our time the next morning. We probably didn’t start hiking until 11 am that day which for us is a very late start. We hustled because we knew we got such a late start and really wanted to make it to Fontana Dam that night and stay at the Fontana Hilton. That’s basically just a really nice shelter, with showers, and an incredible view of the dam. Hikers just call it the Hilton because compared to what we are getting used to, that is a Hilton. We stayed with maybe twelve other hikers who got there just in time to hurry out the next morning and hustle up into the Smokies. We all feared that if we didn’t get up to those high elevations before the snow, it would be much harder getting up with the six inches of snow that was forecasted. I woke up at 5:30 that morning to catch the sunrise over the dam. The picturesque sunrise combined with the beginnings of a snowstorm and the jitters I had knowing how high I was about to climb is a feeling I will never forget. The Smokies have been so much harder than we thought they would be. It seems all the hikers that we talk to along the way agree with those thoughts. Maybe it’s the elevation combined with steepness? Maybe it’s just much colder with the wind being up about a 1000-2000 ft higher than we are accustomed to? Whatever it is, these mountains are a fun test! Even with the snow covering them they manage to stay so green. Tennessee was the first taste we had that made us feel we are actually hiking north. 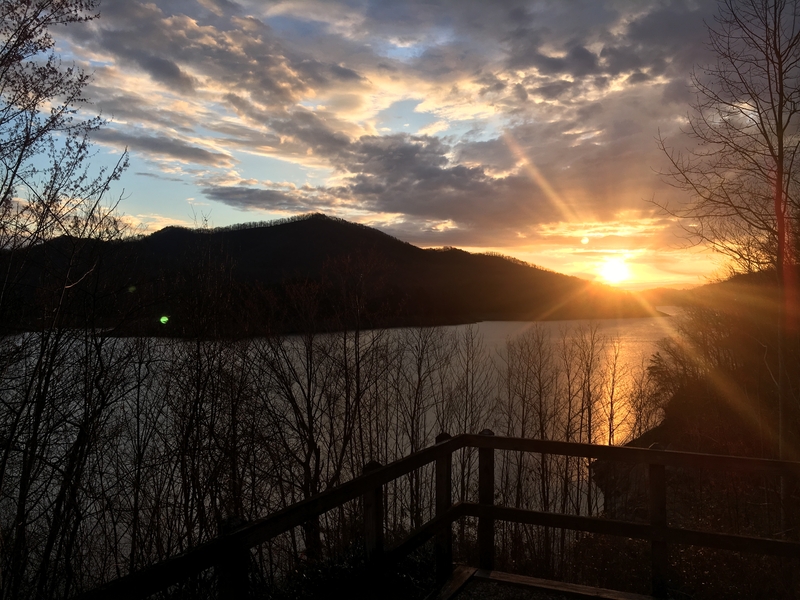 Each day is a new challenge with the same variables here in the Smokies. Right now we still have about five or six inches of snow on the ground and because of it, all hikers the last three days have been encouraged to get off the trail and down into Gatlinburg, Tennessee by park rangers which brings us to where we are now! This is by far our favorite town. We were told it is only second to Las Vegas in weddings in this country and is called the Vegas of the South. There are so many shops and tourist attractions along its main street and at all times of the day the streets are packed with people. If you close your eyes you will feel like you are at a carnival from the smells of the foods, candies, fudge, and restaurants. Unfortunately, there is only one road that takes you up the mountain to the gap we got shuttled into town from and it’s closed. So unless we want to hike eleven miles up a windy and snow covered road, we’re stuck in the awesome town another day. 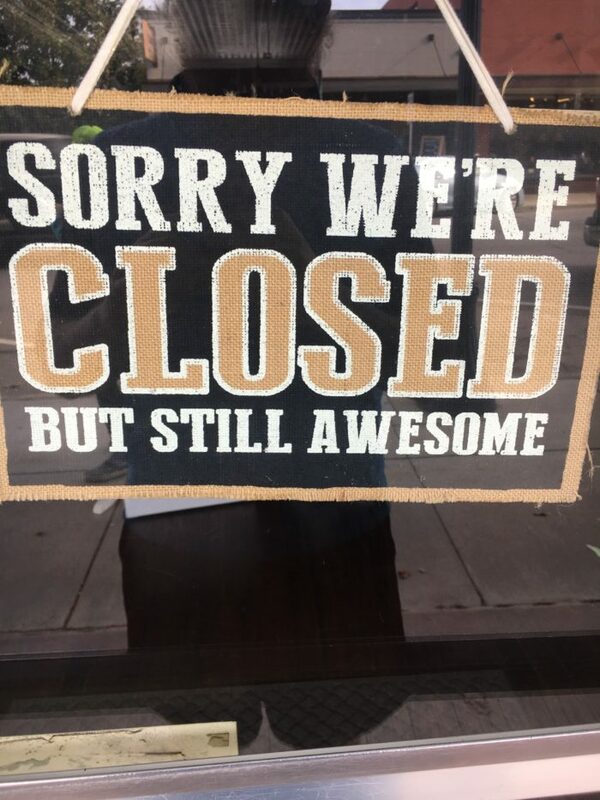 Darn…. We were able to catch up with some friends we haven’t seen in a week or so and finally plan on hiking together again. 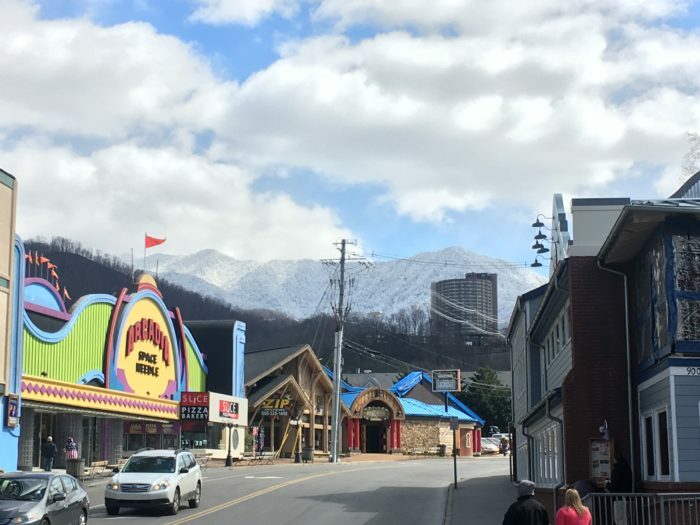 If you have the time, stay in Gatlinburg and really take the time to see this town. Be careful though, it’s super easy to splurge. We may or may not have bought a bottle of whiskey after a moonshine tasting to bring back for those extra cold nights. Up next is almost a whole week in the woods before our next town! See you soon! I am choosing to define myself by the adventures I take. For a long time I defined myself by my career and I was not balanced. I decided to take a step away and hike Appalachian Trail. I hiked it, returned to my career, quit again, and now am preparing to hike the Pacific Crest Trail. I'm not sure where life is headed at this point in time, so let's go for another walk? Keep going guys! I am proud of you. I brag to my 14 friends I go to breakfast with every Friday and tell them of your progress. I will miss the next couple of Fidays but will be following you. I go into surgery tomorrow morning to replace my left knee. Hi you two, I talked to Alex mom and she told me about you blog and We just finished reading all of your blog. Wow what an adventure and love those pictures keep taking them. Angie and I pray for you two everyday that all goes good and healthy. Can’t wait to read more. Love Dad and Angie and two cats ❤? There’s no getting around it. Thru hiking is expensive. Gear, food, and hostels can set you back thousands of dollars. Add those expenses up with your car insurance, bills, and rent/mortgage while you’re away and a 6 month adventure can end up costing a small fortune. You can attempt to alleviate some of the financial strain on your pockets by contacting companies to see if they are willing to sponsor/donate product to you for the hike. It’s not as easy as you may think. It takes a ton of time, patience, and perseverance. I have been EXTREMELY blessed with some amazing companies that are helping me out with my adventure. I’d like to share how I’ve found success as well as some of the companies that have been generous enough to donate product for my hike. I’ve found that most big box (well known) companies do not get involved with individual hikers. This is understandable because most of these companies donate a lot of time and money to trail maintenance and organizations that need the help. That being said, there are many smaller companies out there who aren’t well known to the hiking community but really should be. Finding these companies, trying their product, and deciding who you would like to pursue a mutually beneficial agreement with will take time and patience. I choose only to write to companies with products that I truly believe in, and I suggest you do the same. Who wants to support something they don’t believe in? Once you find companies that you would like to work with, it’s time to start drafting letters. I like to begin with an introduction outlining who I am, what my goals are, and why I’ve chosen to set those goals for myself. Connecting with the reader on a personal level will give them an understanding of who you are and allow them a glimpse into your life. The more you know about someone, the more likely you are to take an interest in their pursuits. Don’t get too carried away. You don’t need to tell them your entire life story. After an introduction, it’s time to relay your love for their product and why you think it would be beneficial for other hikers on the trail. Letting them know that their product could thrive in the outdoor community will perk their ears as it’s an opportunity for them to expand. This rings especially true with nutritional products. If you are like most thru hikers, your diet consists mainly of Snicker bars, Ramen noodles, and pasta sides. Anything that will get you more calories is enticing. In my opinion, this is not the way to go about eating. Just because a honey bun is 500 calories and delicious, doesn’t mean it’s the best option. Having the right vitamins and nutrients in your body can be a game changer. Enlightening these companies on the typical hiker diet and why their product would help to improve the experiences of hikers on the trail is a good segue into you proposal. It’s time to let them know what you are asking for. Be reasonable, honest, and respectful. In other words, don’t ask for hundreds of dollars worth of stuff. After you detail what you need, it’s time to sell yourself and explain what they will get in return for their donation. Are you very active in the online hiker community? Do you have a decent following on social media platforms? Do you have a YouTube channel? For me, I am a member of several backpacking forums on Facebook. I also am active on Instagram, Snapchat, and Twitter. Explain to them how you can help advertise their product and spread the word. This is why you only want products you truly believe in. It’s your belief in the products that will make your job an easy one. You’d be surprised at how a simple Facebook post can get people asking questions and talking. For instance, yesterday someone on FB asked what people do for electrolytes on the trail. I replied “My solution for electrolytes is Cocohydro by Big Tree Farms (one of my “sponsors”.) Dehydrated coconut water is an amazing source of electrolytes and the stuff tastes awesome.” Almost immediately I had several people asking me for pictures of the product and where they could purchase it. This is where your value to companies lies. Spreading the word and introducing their product and it’s benefits to the hiking community can go a long way. Let them know this. You have value. I am doing a fund raiser for The Optic Neuritis foundation. It’s my goal to raise them $3 for every mile I hike. Telling your potential sponsors that you will be hiking to benefit a charity lets them know that you aren’t just some greedy hiker trying to get free product. Choose something that is close to home. I have Optic Neuritis so my choice was obvious. Knowing that someone is depending on you to complete your goal can help you push through the worst of times. Make the hike about more than just you. While you are walking you can be raising money and helping people. Why not do that? There are tons of amazing charities out there. Pick one and give back. Karma is real. Thank them for their time. If they make it through your letter and it is well written, you may actually hear back from them. My success rate is about 1 in 12 companies, but many of them were big box companies I shouldn’t have bothered with in the first place. Not that I don’t love the bigger companies… I just understand that if they donated to every hiker that asked they’d be out of business. Many of them help the hiker community in other ways. As I stated above, I have been very blessed. I have nine companies that have helped me out with products. Two of them have chosen to remain anonymous because they don’t donate product often and have made exceptions in my case. Altra running- Lone Peak 2.5 …Ask anyone who has ever worn them. These runners are not only comfortable, but extremely durable. Vitchelo- If you need an affordable quality headlamp check them out. They’re a best seller on Amazon. Simple Squares- Amazing Organic Paleo nutrition bars. Only 5 ingredients and gmo and gluten free. Big Tree Farms- Cocohydro is dehydrated coconut water. I lived in Hawaii for 5 years and this tastes like the real thing because it is. Four Sigmatic- Cordyceps elixir is simply awesome. Drinking this in place of coffee in the morning provides sustained energy without the crash. Raw Revolution- Glo bars contain high amounts of protein and contain organic and raw ingredients. Get some. Treat your taste buds.I love em. Dr. Bronners- The soap for everything. body, hair, dishes, cleaning, and even laundry. 2 drops goes a long way. Best soap ever. Fair Trade and gmo free too! The products below are going to help me get to Maine and I can’t thank these companies enough. This website contains affiliate links, which means The Trek may receive a percentage of any product or service you purchase using the links in the articles or advertisements. The buyer pays the same price as they would otherwise, and your purchase helps to support The Trek’s ongoing goal to serve you quality backpacking advice and information. Thanks for your support! Hi. I’m Griz. I have bilateral optic neuritis and have less than 5% of my visual field remaining. My passion is hiking. Over the course of 2015-16′ I completed hiking the Appalachian trail. This year, I have my sights set even higher. I’ll be hiking the PCT! Adam: Thank you, thank you, thank you. This was thoughtfully written with good ideas esp. social media. I’m going to try it for next year. Thanks! I’m glad you enjoyed it. ? I hope it helps your hike. ? You’re welcome! I hope I’ve helped. It takes time. A LOT of time…but the key is to be persistent. ? Subscribe to this blog and you can follow my adventure and catch the occasional tips! Just wanted to thank you again for that Lime Cocohydro you gave me on the Garfield descent.